"Good luck to both teams and as Bruce Forsyth would say; good game, good game." That reference to the Generation Game via Hawick Royal Albert's tannoy system 10 minutes before kick-off was just one of a series of flashbacks to the 1970s, '80s and '90s during a Saturday afternoon when they certainly did "play this at home". Football fever gripped the Borders town and for once Hawick's rugby match against Currie in the adjacent pitch was a sideshow as Huntly visited Albert Park for this Scottish Cup first round contest. There are few other competitions like it. A showpiece which shines the spotlight on nooks and crannies of Scotland to rightly expose the hard graft and goodwill of many souls who strive to make their own little clubs exist and survive. On this occasion one of them is Daniel Drummond, whose joint job title on a Hawick Royal Albert match day is both treasurer and barman. "I'm absolutely buzzing," he beamed in between pulling pints. "I've been looking forward to it for weeks. "I jumped out of bed this morning rather than going back for a long lie. It's just like family here." That was certainly true for Norrie Gray, one of Daniel's customers who doubled up as father-in-law of Albert's midfielder Stewart Crozier. However, this queue for pre-match drinks consisted of all sorts. 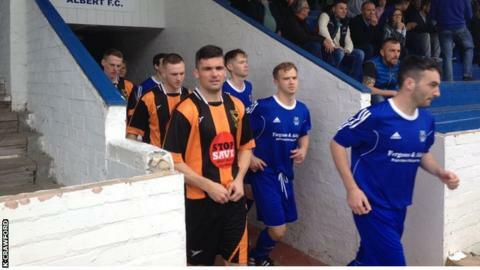 Next to identify himself was Huntly chairman George Clark, who acknowledged the 216 mile trip was "a long way to come" but just part of the "magic and mystique" of the Scottish Cup. Glasgow's Willie Blain and Tom Brand also had some miles under their belt, yet offered a completely different back-story. "We've come down here with our wives for a long weekend," explained Blain. "But when we're away we always try and take in a local game, no matter who it is. It's a great day out." Brand added: "They're quite happy going round the shops and it gives us the chance to get a pint and watch a bit of football." For those guys it was a first ever visit to Albert Park, but sitting 10 metres away from that pair was a bearded fellow who appeared to be a more regular piece of furniture in these parts. "My name is Bob Muirhead and I used to be manager here," said the dapper fellow, his voice strained from years of barking instructions. "It was a young side playing the passing game and if you gave the ball away there was trouble. "I'm 82-years-old now but when I meet the young guys in the street they say I'm the best manager the Albert ever had. That's always a good thing for me." Not so great, though, was his dismissal from the post in 1986 after three successful years. "I played a player that wasn't registered," explained Muirhead. "But I had phoned up Glasgow and they said I could play him if he was an amateur, so I played him and got sacked. "Getting sacked when you're joint top of the league - it's ridiculous. You had butchers, bakers, candlestick-makers on the committee and you hadn't a chance - they would hang you at the slightest thing. "However I'm praying that the Albert get a result today, but not a draw because we can't afford to go up there." Leaving Muirhead on his knees, the transformation from the 1980s to the 1990s took place in the home dressing room. In preliminary round success over Wigtown & Bladnoch, captain Mark McEwen had inspired his troops with a pre-match rendition of 'Saturday Night At The Movies' by The Drifters. For the first round proper, McEwen handed singing duties to midfielder Darren Linton, who, complete with coat and sunglasses, treated teammates to 'Wonderwall' by Oasis. A raucous cheer showed that, by now, The Albert had realised what they had to do. Alas, the road that leads to Scottish Cup glory is winding and if our man Bruce Forsyth asked us to have a look at the old scoreboard come the final whistle, it would read Hawick Royal Albert 0-3 Huntly. Two low, clinical strikes by Ernst & Young chartered accountant David Booth and a volley by Gary MacNamee did the job for the Black & Golds. Their manager Gregg Carroll played down his chances of getting to pick the tunes for the bus trip back north. "No chance of that," he smiled. "My music taste isn't very good and I'd probably pick Queen or something like that. "We've got a couple of new lads who need to do a wee sing-song so we'll have a good journey up the road, that's for sure." One of the distinguishing traits of clubs at this level is that even in losing, they can rise above natural disappointment to look at the bigger picture. Albert skipper McEwen spoke of the "honour" of getting to captain a team like Hawick, while manager Dean Shanks also chose to be positive. "It's about building something here and it's just fantastic to get the opportunity," he concluded. "Everybody in the town is starting to take notice that Hawick are on the way back up." Hawick Royal Albert and Huntly; nice to see you, to see you nice.